Shopping for Custom Blinds, Plantation Shutters, Solar Shades, Roman Shades or Window Treatments from the convenience of your home or business? We can help! Bring an exciting new look to your home or business with custom window treatments offered by A Blind View. Our expert style consultants are highly trained in the blinds, plantation shutters, and window treatment fields and offer some of the newest and freshest ideas in the blinds industry available today. With the busy lifestyles of today's families, we try to make things as simple and convenient as possible. 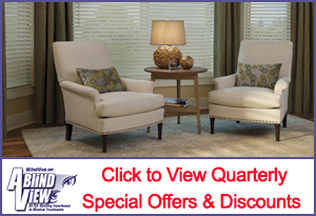 All you have to do is make an appointment with one of our blinds specialists, and we will handle it from there. We'll come to you with numerous blinds, shutters, shades and window treatment samples to choose from and we'll offer a solution based upon your needs, and provide expert measuring with a written quote. Soon after your order is placed, we'll receive your blinds and call you to set up an installation appointment. It's that simple. We look forward to meeting with you. 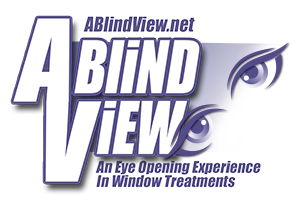 Give us a call and see why our clients say, "A Blind View custom blinds, shutters and shades is truly An Eye-Opening Experience in Window Treatments!" Contact us for all of your Window Treatment, Custom Blinds, Plantation Shutter, or Solar Shade needs! Serving Knoxville, Farragut, Clinton, Oak Ridge, La Follette, Oneida, South Central KY, Somerset and surrounding areas.